Grow sedum indoors with relative ease by following basic gardening guidelines of controlling the soil mixture, sunlight, water and fertilizer. Sedum plants are a genus of 400 varieties of succulents in widely diverse colors and shapes. A succulent retains water in the plant structure and has a waxy surface. They are hardy plants commonly used as ground cover. Sedum plants have very few natural pests, are drought resistant and grow prolifically. 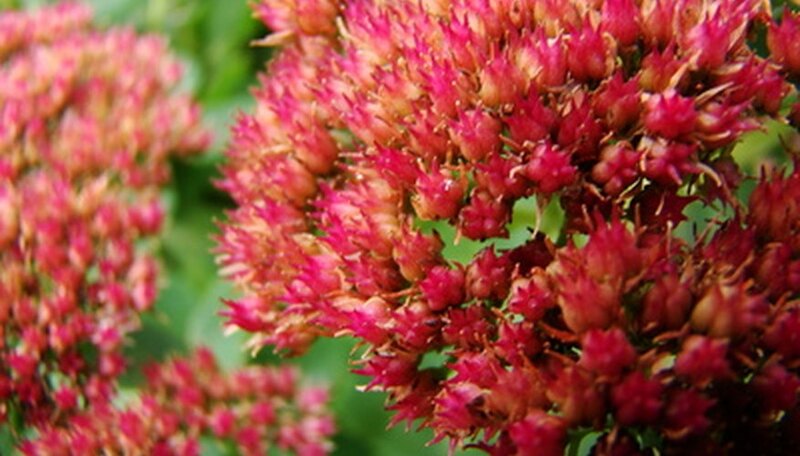 Sedums are a forgiving plant that does not require constant care to flourish. Mix a light well-draining soil with good aeration by combining one part peat moss, one part clay loam and one part coarse sand or perlite. Remove the plant from the nursery tray and place it in the pot while being careful not to break the fragile leaves. Fill in the space below and around the plant with the prepared soil mix. Water the plant after potting by placing it under a faucet in the sink and gently running water over the entire plant, drenching the soil. Set the pot on a drain tray filled with clean gravel. Allow the plant to dry out between watering and moisten the soil throughout while permitting the water to sit in the drain tray to generate humidity for the sedum. Apply a fertilizer mix of one teaspoon of soluble 20-20-20 or 5-10-5 fertilizer in 1 gallon of water and administer once each month. Place the plant in a sunny west- or south-facing window where it receives at least eight hours of direct sunlight daily. Give the plant a bushier, more compact appearance by pinching off the buds at the ends of the branches. More buds will form. Pinch off the long branches close to the stem to eliminate a leggy look. The more sunlight the plant receives, the more varied the colors will develop on the plant. Sterilize the soil mix to remove weed, insect and disease organisms by placing the soil in a shallow pan, place in a preheated oven at 180 degrees F and heat for 30 minutes. Sterilize all gardening tools and containers by washing them in detergent, immersing them in a solution of one part household chlorine bleach and nine parts water and then allowing them to air-dry. Use plant supports to prevent the plant from collapsing as it grows larger.